Ramon Novarro & Evelyn Laye publicity photo. Brown tint to this Metro Goldwyn Mayer publicity photo. I am not sure which movie this is, but it is a very nice photo. I love the cameo broach on her dress. This has a couple of bent corners in the border area but is excellent in the photo itself. 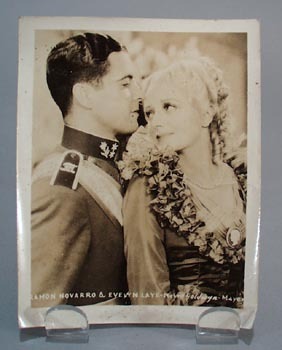 4 x 5""
Items Similar To "Ramon Novarro & Evelyn Laye publicity photo"